When we decided to relocate from the UK to Italy, one of the very first things I researched were the prices of food. With initially one salary to support our little family of three, I wanted to make sure that we could actually afford to live there. After scouring Italian websites for days, I managed to unearth the page of a local supermarket listing different foodstuffs and how much they cost. I remember turning to my then fiancé (now husband) and declaring: ‘It seems like we will be eating lots of pasta!’. 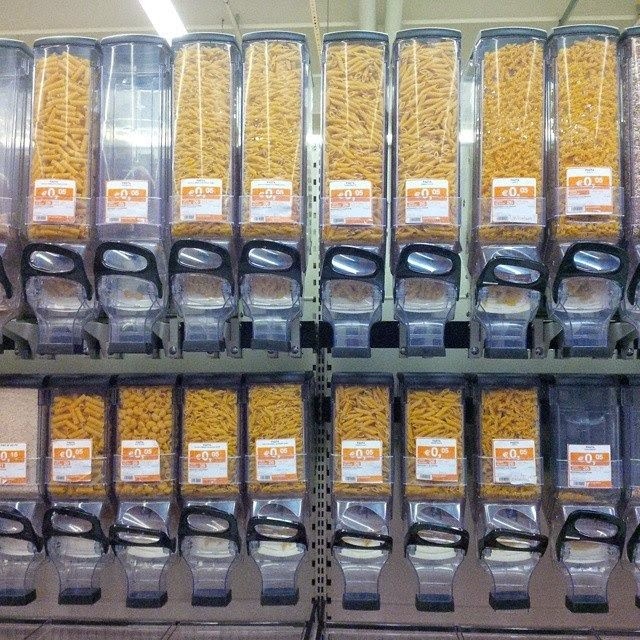 Yes, dry pasta in Italy is (shock horror!) cheap! A half-kilo pack will set you back anything from 60 euro cents to over an euro for the fancier stuff. What about the rest? Well, it seems that when you move to a foreign country, one of the things that initially take lots of your time is to find where to shop and to establish the local equivalents of what you are used to buying back home. Our first shopping expeditions around an Italian supermarket would easily take us up to 2 hours. Not only we are shopping with an inquisitive toddler who likes to explore the shelves and add items to our shopping trolley, but at the beginning we needed time to decipher the Italian-only labels on most products. Then there was the appropriate shopping etiquette that we had to discover on the go. So, the following ten differences between shopping in an Italian and a British supermarkets are based on our personal experience and copious amounts of blood, sweat and tears shed whilst mastering such a basic thing – hunter-gathering a family’s weekly food supply in an unknown territory. 1. You can’t touch the fruit and veg without a plastic glove. This was one of the very first things we learned. Thankfully, I found out about it whilst doing my preliminary research on living in Italy, so this saved us the embarrassment of being told off by staff for touching stuff with our bare hands. As we are in a country where the concept of bella figura counts, the fresh produce in any supermarket is arranged beautifully and plastic gloves are provided for all customer-handling operations of the oranges, tomatoes and other fruit and veg which you may want to buy. The gloves are quite uncomfortable and make your hand (or is it just me?) feel super hot, but at least deep inside yourself you feel reassured that no grubby hands have manhandled the exotic salad you are about to put in a plastic bag. 2. You need to weigh and price your selection of fruit and veg before taking it to the checkout. Once the plastic glove is on and you have placed some fruit and veg into separate bags, you need to take the bags to the weighing machine, press the code of the respective fresh produce (indicated on the price tag by the crates with it), take the pricing label which the machine prints and stick it onto the respective bag. Oh, and don’t forget to tie up said bag with your fruit or veg in it before weighing it. All the while ‘dancing’ around other customers who pick their own fruit and veg, pack them in their respective bags and clog the weighing machine just when you need it. It is quite a long process, which made me appreciate the convenience of having your fruit and veg weighed and priced at the checkout in the British supermarkets even more. The way we try to shave some time off this complicated exercise is for me to get a bunch of plastic bags, open them one by one, and then pass them to my husband, who, plastic glove in place, picks the fruit and veg we need, ties up the bags, passes them to me, tells me what code to punch in the weighing machine and then I do the rest. At the end I pass the bag to our little toddler who solemnly places it in the shopping trolley. Getting our five a day has become a proper family teamwork. 3. They sell horse meat. Yes, and it is the real stuff! Not simply minced and hidden into a product labelled as ‘beef’. 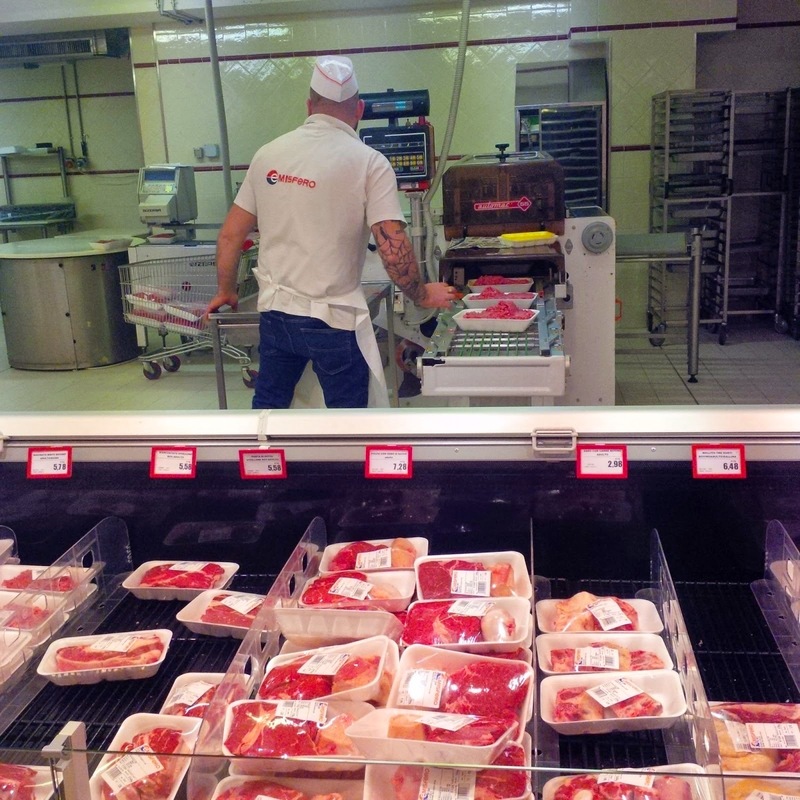 Meat shops and supermarket meat counters in Italy sell horse meat and label it as such. I can’t help it but flinch a little every time I come across it whilst we pick some chicken, pork or beef. Horse meat has a very intense red colour, which persists in the salami and other dry and cured meats made with it. For example, you can buy bresaola made of horse meat in our local supermarket. I have never been tempted, but it is part of the local culture and let’s leave it at that. 4. There are no BOGOF deals. If you are used to the prevalent deals of ‘2 for 1’ or ‘Buy One get One Half Price’ so abundant in British supermarkets, you may be left disappointed when you don’t find them on an Italian soil. Instead there are ofertas or simply ‘offers’ meaning that in general a particular product has been very temporarily and mostly only slightly reduced. The supermarket chains also publish weekly newsletters advertising their latest offers, some of which are sotto costo or ‘less than cost price’. I personally find it quite exhausting having to go to the other end of town only to get a panettone for 2.90 euros, when the local supermarket sells it for 3.40. Another thing that made an impression on me is that the signage in supermarkets here seems much more sparse and discreet. Italian supermarkets somehow feel more spacious without many huge signs advertising the latest deal. Mostly there are just some very humble labels pointing to an offer or two. Another thing in this respect is the lack of price-matching which one has come to expect from British supermarkets. Even though the number of supermarket chains in Italy is much larger than in the UK, you pay the price the respective supermarket asks you to pay and don’t expect it to price-check and -match the prices of a competitor. 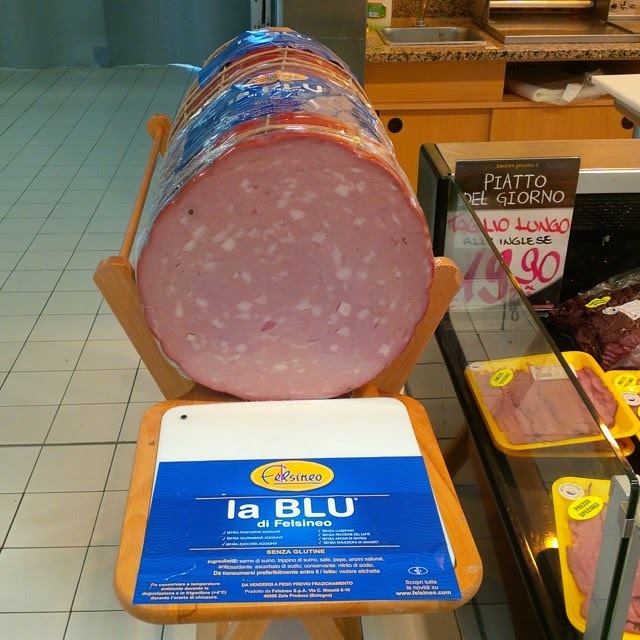 At the start of our life in Italy and being well-conditioned from the UK, we did try to go to a number of different supermarkets and establish where we would find the golden ratio of quality at the right price. Our experience was that, yes, some products would be cheaper in some places but other products there would be more expensive than in others, so it all would level off. At the end, we decided to simply do all our shopping at the local supermarket, which is smaller than the behemoths one can find around Vicenza, but it has a great selection of products and the prices are comparable with the rest. 5. Checkout staff seems under no obligation to smile at you or chat with you. It’s nothing like in Sainsbury’s in the little town in Kent where we lived before moving to Italy. There the checkout staff would have whole conversations with us whilst scanning our shop. No exceptions! Everyone was friendly, sometimes excessively so. My experience in Italy so far has been slightly different: some people smile and chat with you and laugh at our broken Italian. Others simply ignore us whilst they do their job. I don’t mind it either way. It is just interesting to observe. 6. Sales of seasonal products start after the seasonal event has passed. Yes, this is one thing I actually miss from the UK. Seasonal products there appear on the shelves so far in advance before the event, that when Christmas or Easter finally come, most seasonal foodstuffs are already significantly reduced. Not so much here in Italy. I was really looking forward to stocking on some panettone after Christmas to last me until the Easter cakes hit the shops. 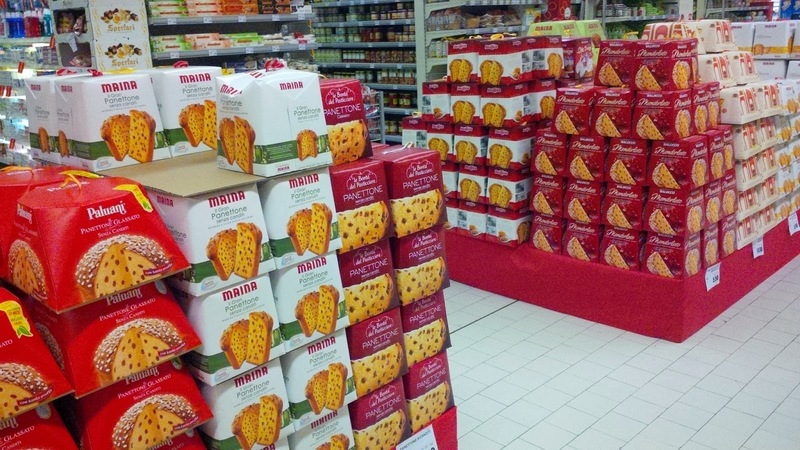 Unfortunately the sale of the panettone was such a non-event that I completely missed it. When I eventually noticed that the panettone was on sale, there were only a few boxes left and they were only marginally reduced. Luckily for me, I didn’t have to wait long before the Easter cakes appeared on the shelves (only about a month and a half, if I remember correctly), whereas in the UK they would have been stocked straight from Boxing Day onwards. 7. Grissini and not crisps are the snack of choice. The selection of crisps is rather small. Instead a whole aisle is dedicated to grissini and dry bread-based snacks. They come in many different flavours, too. Pizza, sesame and fennel being my personal favourites. 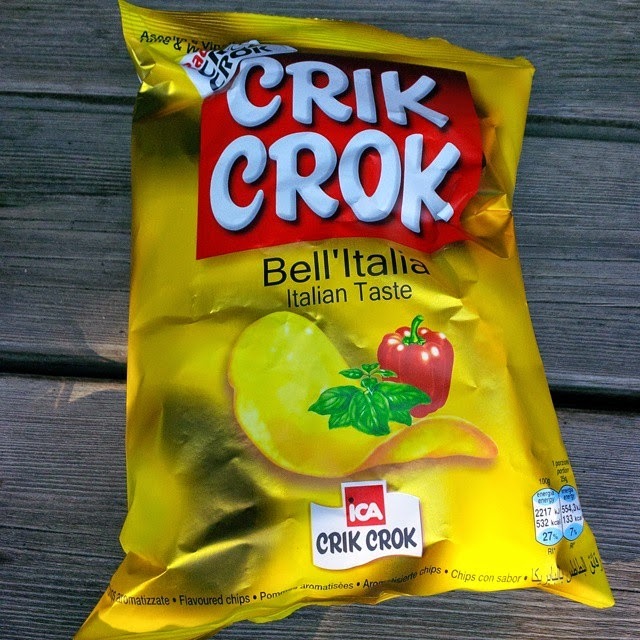 I have never been a big crisp eater (a crisp sandwich is rather gross, if you ask me), but even I noticed how under-represented are crisps in Italy. They do sell them, but often their flavour is localised. For example, see below. I rather enjoy the grissini though. They have a beautiful crunch and are much less oily than crisps. They also go well with a bit of cheese or salami. Perfect for a breakfast on the go. 8. Salami and cured meats are always sliced thin. And I salute Italian supermarkets for this. If you have ever been sold thickly sliced chorizo in a British supermarket by a deli counter assistant who decided to save himself the effort, you will understand. Try biting into that chorizo when it is thicker than a pound coin. In Italy our salami and cured meats order is always so thinly carved that the slices are positively see-through. Each slice simply melts on the tongue, releasing the full flavour instead of having to bite a piece off it and then chew it for minutes on end. A small issue, you may say, but when you enjoy good food, why not enjoy it well. 9. Bags are paid for. Another thing which I applaud Italian supermarkets for. In fact, if you ask me, bags should always be paid for all over Europe. We have always been one of those boring couples who bring their bags-for-life, but if on occasion we forgot them, I didn’t feel guilty about helping myself to the free plastic bags the British supermarkets so generously provide. It may come across as small-minded or being tight, but having to pay 15 euro cents for each bag now really makes me think about the number of bags one needs when packing a weekly shop. It is also an extra incentive never to forget our big orange Sainsbury’s bags. 10. The emphasis is on local seasonal produce. Back in the UK we were used to buying asparagus from Mexico, strawberries from Spain and green beans from Kenya. And no, we were not shopping in some fancy supermarket, just in the local Sainsbury’s or Asda. Seduced by the ever present selection of fresh fruit and veg, I rarely stopped to consider food miles. 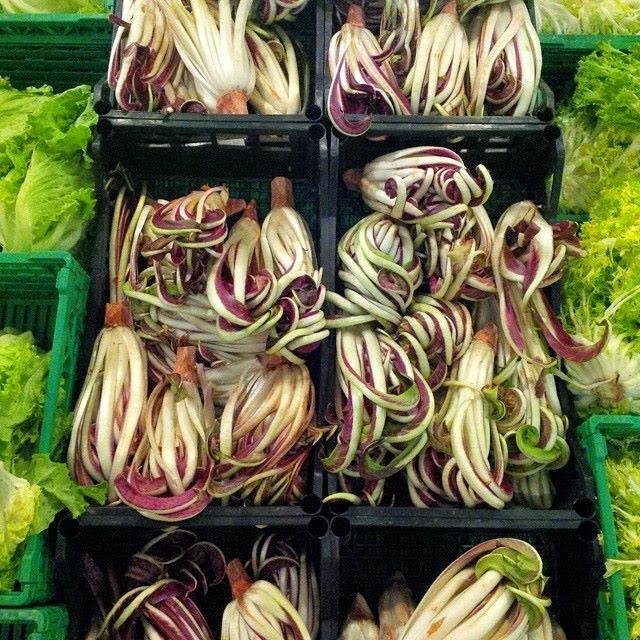 In Italy the selection is always seasonal and sourced locally most often than not. We are currently enjoying green and white asparagus grown up only a few miles away from us in the region of Veneto, before that we had a chance to buy some broccolo fiolaro which is only grown in the hills outside Vicenza for a few weeks each winter. Oranges and tangerines come from Southern Italy. Everything seems full of flavour thanks to days spent under the sun, rather than shivering in a refrigerating depot. It is also interesting to watch how the price of the fruit and veg which are nearing the end of their season begins to increase and how the price drops as soon as their season starts in earnest again. I like this dependence on local produce rather than maintaining a constant selection of fruit and veg even if you have to fly them in half way across the world. In conclusion, shopping in Italy has been part of our steep learning curve of living abroad. Now that we know our way around a local supermarket we feel much more comfortable about the food choices we make. Comparatively speaking our food bill is more or less the same to what we would spend in the UK – on average about 80-90 euros per week (not including the gelato tubs which we buy almost every other day from a little corner shop). Prices of food in Italy do seem initially quite high, especially due to the lack of BOGOF’s and other marketing tricks. Also, the purchasing power here doesn’t seem as high as in Britain, where supermarkets would do anything to get hold of an extra pound or two. The good thing is that we actually eat everything that we buy and very rarely if at all waste food, which, I am ashamed to admit it, was quite normal when we lived in the UK. I hope this long piece was of some use to you, especially if you are thinking of relocating to Italy or you are just starting your new life in this beautiful country. All of the observations above are based on my personal experience, so if your opinion differs, please, let me know if the comments below.